Open all Bank Holidays between 6th March and 31st October. On the N bank of the River Yare about 3.5 miles NE of Reedham. Train from Norwich or Great Yarmouth to Berney Arms station, or from Halvergate on foot (3.5 miles). One of the finest of Norfolk’s tower mills, in the care of English Heritage. It has seven floors, and is the tallest mill in the Broadland area. It ground cement clinker until about 1880, and was then used for drainage until 1951. All enquiries: Tel. 01493 857900. Access to the mill is by pre-booked group tours only. For further information please contact Great Yarmouth Row Houses on 01493 857900. PLEASE NOTE: The mill does NOT have any access by road. Access on foot from Great Yarmouth (6 miles) or Halvergate (3 miles), alternatively by rail to Berney Arms (request stop only) or by privately hired boat. The visitor centre and mill are open at weekends from 16 April to 30 September 10am till 4pm During the week, there are frequently members of FoHW working at the mill. They will often be able to show visitors around, but access may be limited depending on the nature of work being carried out—please don’t be offended if it is not possible to view the mill. Note – There is now an overnight mooring fee or £5.00. In September 2006 a new cap and sails were fitted by local millwright Richard Seago of South Walsham as part of a two year restoration programme. 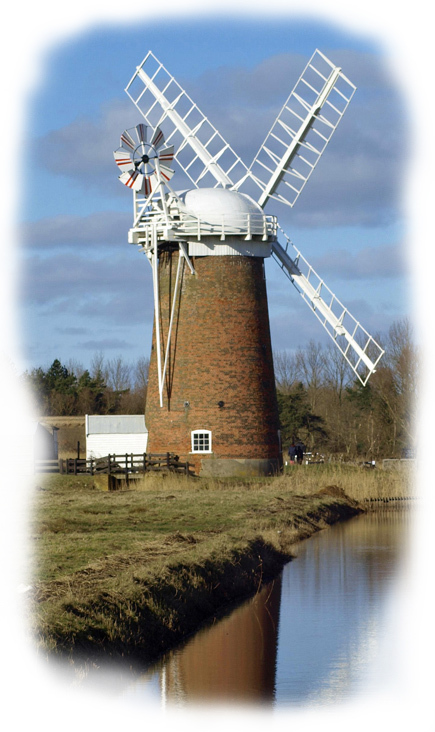 The mill was then opened to the public by prior arrangement with either the Norfolk Windmills Trust or the owner, Tom Banham. Heritage Open Days Sunday 11 September 13.00 – 16.00. Access by boat or the Wherryman’s Way riverside walk. No Vehicular access. Situated on the River Ant near How Hill, 200 metres north of Boardman’s Mill and visible at all times from the river and public footpath. The sails of this hollow post drainage mill have now undergone full restoration. Situated on the A47. Open to the public from Easter until the end of September daily between 9.00am and 8.00pm, subject to completion of Phase 2 repairs. Please telephone 01362 869394 for confirmation. Visits at other times by arrangement with the Trust. Free Moorings. Tearoom and shop on site. Exhibition on drainage mills of the Broads. This tiny, timber boarded trestle drainage mill with a scoopwheel is visible from road and river and can be approached by footpath from the bridge. It is situated on the east bank of the River Waveney, just below St Olaves’ bridge on the A143. Major works are complete following storm damage but access is still restricted due to brickwork repairs required to the outfall waterlane.